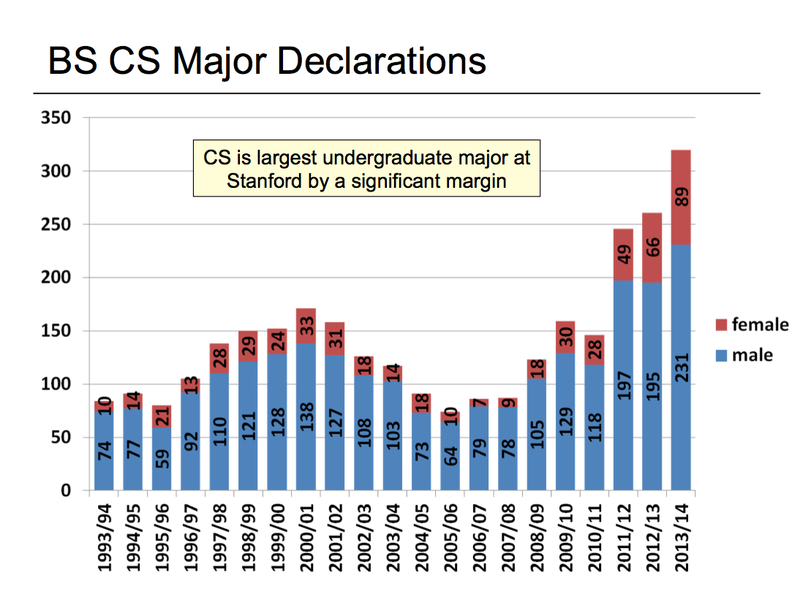 I visited Stanford the other day to talk about some of the things happening in the undergraduate department, mostly to do with CS198, which I’ve written about before (and will again!). But this is amazing. Nearly 350 CS majors last year, compared to just under 1,700 that matriculated starting 2014. Obviously we are in a boom, but I personally don’t think we will see a pullback like what happened after the 2001 dot com crash even if the tech economy cools off a little bit — we are in a permanent software revolution at this point. We are heading towards 100 female CS majors (and already are at more women majors than total majors when I was there). That’s huge progress, and due to tons of effort by many in & around the program. 25% is good, but not enough, certainly. The first thing to note: 1,550 students in 2013/14! Out of right around 1,700 undergrads. Realistically it’s a bit bigger denominator than the 1,700 because some graduate students take the course, but it’s still amazing to me that such a high percentage of students take CS now. But more interesting to me is that in the past 4 years the enrollment of women has moved from about 1/3 to over 40%. That’s real progress. 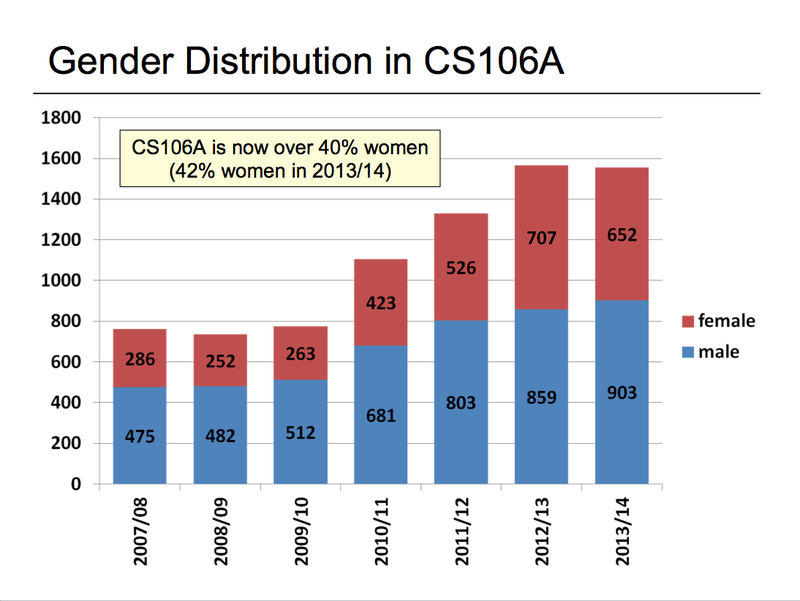 And gives hope that over time Stanford will be able to increase the % of women majoring in CS getting up near more representative of the student population overall. It looks to me like they’ve achieved a critical mass of women in 106A, and I’m hopeful that will lead to a continued critical mass declaring as majors. Time will tell, but I’m optimistic.